Starting a Mobile Detailing Business? Check out Eco Touch’s new Detailer’s Starter Kit! For anyone just getting started in the detailing business, you’ll quickly realize just how many different products are on the market today. While it’s great to have a variety of choices, it can become overwhelming and frustrating trying to figure out exactly what you need to get up and running quickly and efficiently. Since Eco Touch launched back in 2007, we’ve spoken with thousands of new detailers getting into the business and helped them select just the right amount of product they need to begin operations. Based on our experience, we are pleased to announce the Eco Touch Detailer’s Starter Kit! This kit was designed for a fixed or mobile detailer who wants to get into the industry, without committing to a large inventory of product. We’ve included enough Eco Touch to perform upwards of 250 waterless car washes. In addition, you’ll have product for waxing, protecting, cleaning and degreasing every other part of the vehicle’s exterior and interior surfaces. The Detailer’s Starter Kit retails for $499 with FREE Shipping throughout the continental United States. This is an incredible savings of over $70 versus buying each product individually! Click here to learn more about our Detailer’s Starter Kit. 7 x Empty Spray Bottles 24 oz. 2 x Empty Spray Bottles 16 oz. 1 x Empty Spray Bottle 8 oz. Can I use a Waterless Car Wash in the winter? One of the most frequent questions we get asked during the chilly winter season, is if Eco Touch Waterless Car Wash can be used. The answer is both yes and no…and here’s why. There are a few factors which will determine whether or not it’s appropriate to use Eco Touch Waterless Car Wash in the winter. 2) Temperature of car panels. Let’s start with the outdoor temperature. If it’s below freezing you’ll want to proceed with caution. Eco Touch Waterless Car Wash does not contain any alcohol, petroleum distillates, or other chemicals which would lower its freezing point. From an environmental and safety standpoint this is obviously a great thing. Unfortunately, when it gets below freezing you may find that the formula does not work as effectively, or may actually freeze on the panel. If this happens simply pull your car into a sunny location/heated garage, let it thaw out and wipe clean with a microfiber cloth. Our preferred method of performing a waterless car wash during the winter is waiting for a sunny day and letting the car panels warm up. Before spraying the formula, do a quick check of the panel by putting the back of your hand to feel if it’s warm. If so, you’re good to continue with the waterless wash.
Acura TSX with moderate soiling. Suitable for a waterless car wash.
One other factor to consider is the dirt-level on the vehicle. Here in New England during winter, we get some very dirty cars. If you see contaminants such as heavy salt or clumps of mud/sand, be sure to pre-rinse these areas first. Then follow-up with the waterless car wash. We always recommend “common sense caution”. If you think a car is simply too dirty, pre-rinse it. It’s okay to use a little water now to assist in the cleaning process. 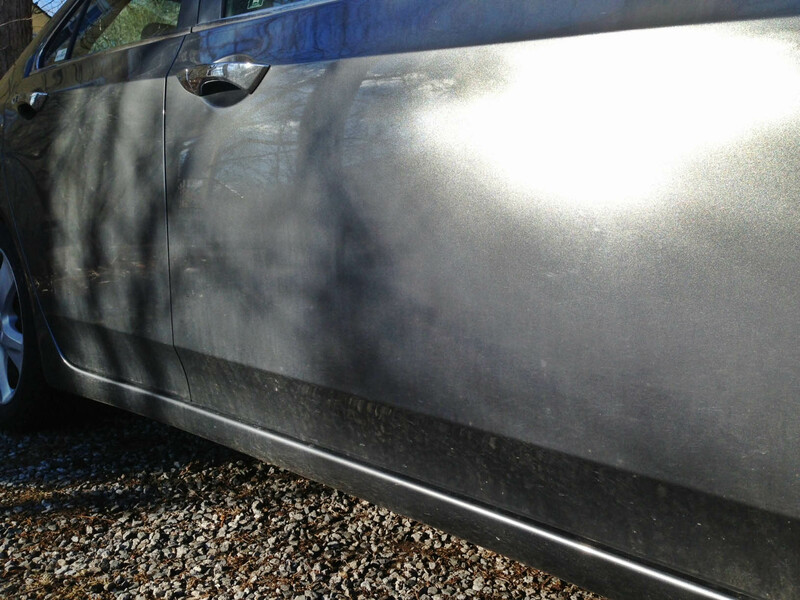 If your car has a light-moderate coating of contaminants you can go right ahead with a normal waterless wash. So that covers using our waterless car wash during the winter. Have a question for us? Email it to info[at]ecotouch[dot]net.